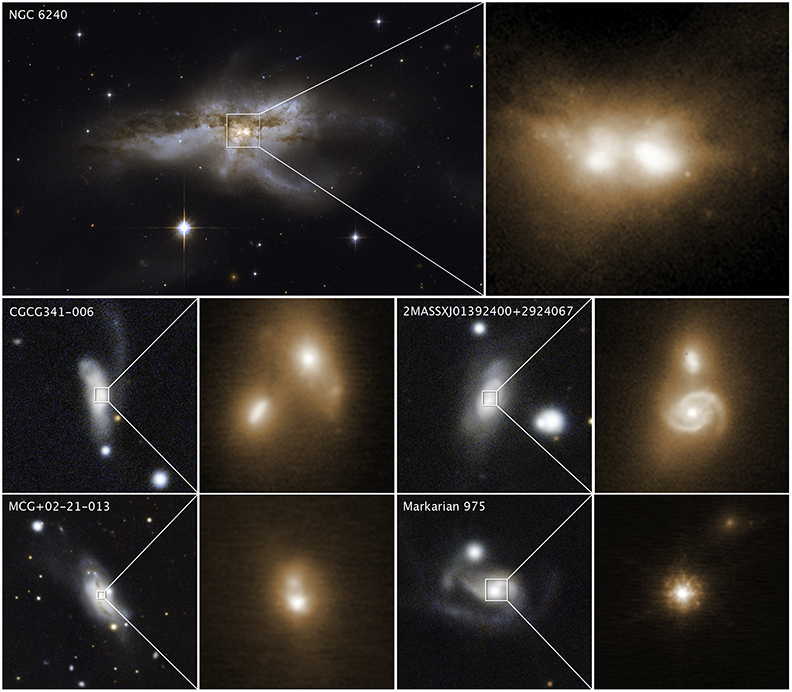 For the first time, astronomers have observed the final stages of galactic mergers, peering through thick walls of gas and dust to see pairs of supermassive black holes drawing closer together and the black holes’ rapid growth. At the centers of most, if not all, galaxies are supermassive black holes with masses that are millions to billions of times that of Earth’s sun. For instance, at the heart of our Milky Way galaxy lies Sagittarius A*, which is about 4.5 million solar masses in size. 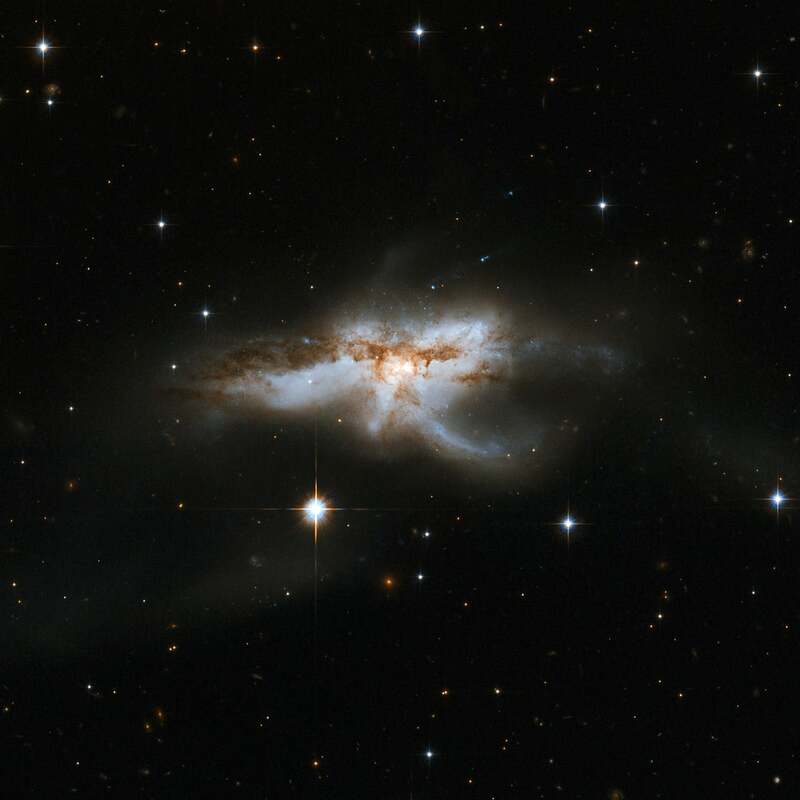 Galactic mergers likely give supermassive black holes ample opportunities to rip apart stars and devour matter. Such destruction releases extraordinary amounts of light and likely serves as the driving force behind quasars, which rank among the brightest objects in the universe. Maunakea, Hawaii – Two galaxies, drawn together by the force of gravity, are merging into a tangled mass of dense gas and dust. Structure is giving way to chaos, but hiding behind this messy cloud of material are two supermassive black holes, nestled at the center of each of the galaxies, that are now excitingly close, giving astronomers the best view yet of the pair marching toward coalescence into one mega black hole. The team’s results appear online in the November 7, 2018 issue of the journal Nature. The galaxy was discovered with data from the European Space Agency’s Gaia satellite, a space telescope measuring the motions and properties of more than 1 billion stars in and around the Milky Way. Gabriel Torrealba, an astronomy postdoc at the Academia Sinica in Taipei, decided to sift the data for RR Lyrae stars. These old stars, often found in dwarf galaxies, shine with a throbbing blue light that pulses at a rate signaling their inherent brightness, allowing researchers to pin down their distance. Nearby planets like this are likely to be prime targets in the search for signatures of life, using the next generation of telescopes. The planet's mass is thought to be more than three times that of our own, placing it in a category of world know as "super-Earths". 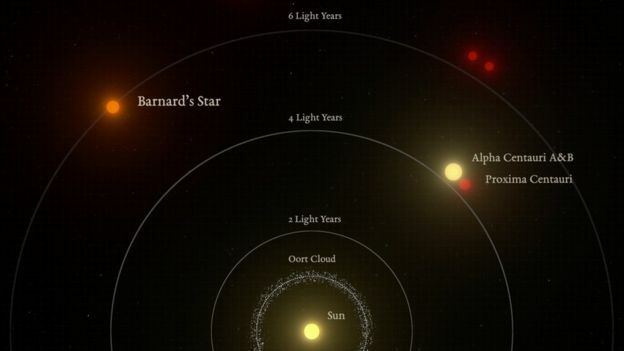 It orbits Barnard's star, which sits "just" six light-years away. Writing in the journal Nature, Guillem Anglada Escudé and colleagues say this newly discovered world has a mass 3.2 times bigger than the Earth's. "We think that this is what we call a Super-Earth - that would be possibly a mostly rocky planet with a massive atmosphere. It's probably very rich in volatiles like water, hydrogen, carbon dioxide - things like this. Many of them are frozen on the surface," Dr Anglada Escudé, from Queen Mary University of London, told BBC News. US space agency Nasa has landed a new robot on Mars after a dramatic seven-minute plunge to the surface of the Red Planet. 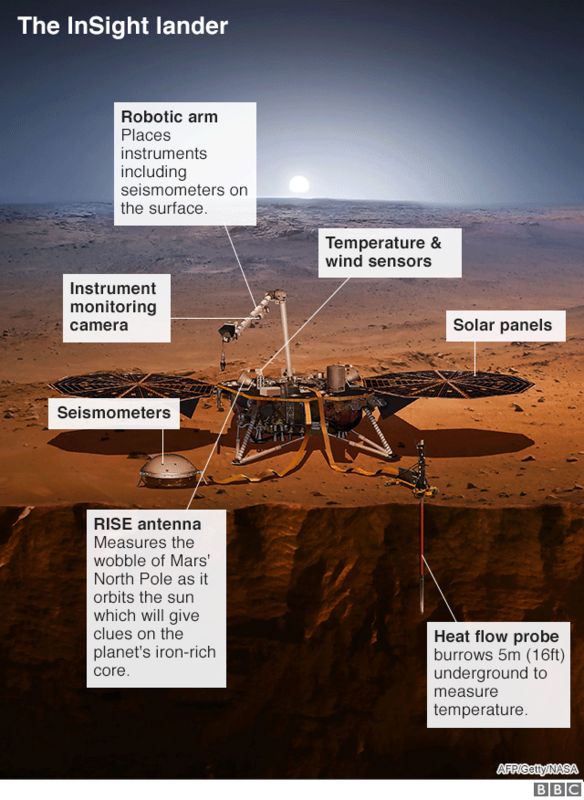 The InSight probe aims to study the deep interior of Mars, and make it the only planet - apart from Earth - that has been examined in this way. The touchdown confirmation came through shortly after 19:50 GMT. It ended an anxious seven minutes in which the robot radioed home updates on its descent. Nasa's mission control in California erupted with delight when it became clear InSight was safe on the ground. The probe landed safely on a flat plain known as Elysium Planitia, close to the Red Planet's equator. Side note, one of the people working on the project is named Bruce Banner. Amazing. 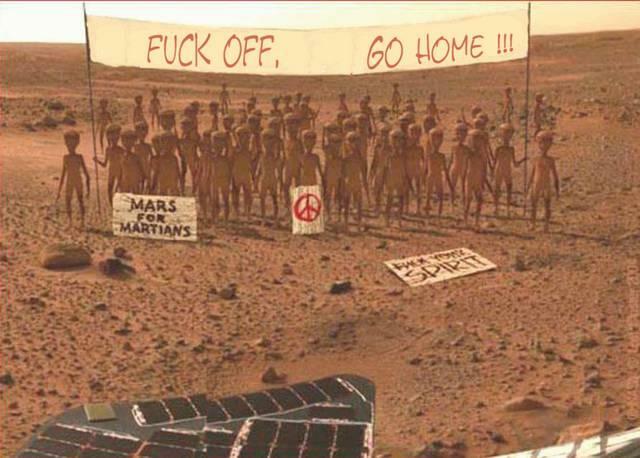 Looks like Mars needs some freedom. Voyager 2 now is slightly more than 11 billion miles (18 billion kilometers) from Earth. Mission operators still can communicate with Voyager 2 as it enters this new phase of its journey, but information - moving at the speed of light - takes about 16.5 hours to travel from the spacecraft to Earth. By comparison, light traveling from the Sun takes about eight minutes to reach Earth. They fake a moon landing and then expect us to believe in this. The firm's SpaceShipTwo passenger rocket ship reached a height of 82.7km, beyond the altitude at which Nasa awards astronaut status. 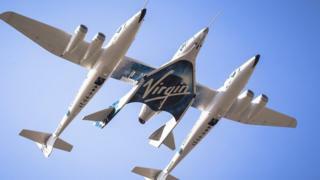 It marked the plane's fourth test flight and followed earlier setbacks in the firm's space programme. He founded the commercial spaceflight company in 2004, shortly after Mr Musk started SpaceX and Jeff Bezos established Blue Origin.